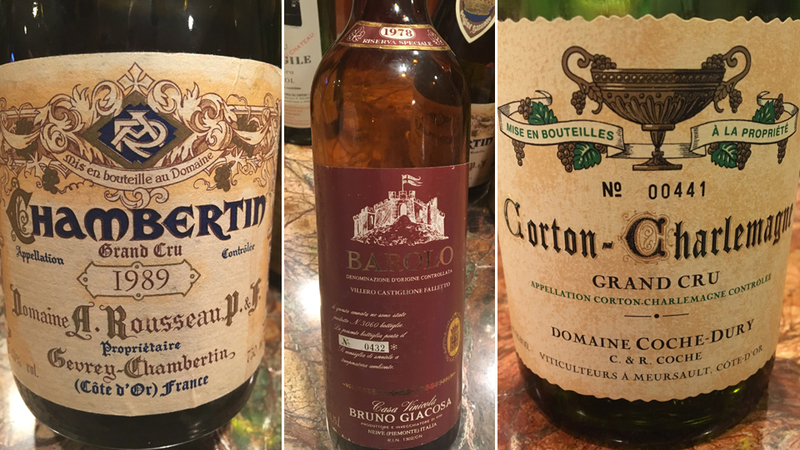 This informal birthday dinner provided a great opportunity to spend time with a small group of friends celebrating life around a number of fabulous wines. Take out dinner from a favorite neighborhood trattoria was delicious, but the focus was on wine and the feeling of camaraderie that sharing great bottles inspires. Champagne to start? Of course. Roederer’s 1988 Cristal Rosé is soft, subtle and beautifully perfumed. A Champagne of total understatement and precision, the 1988 is the perfect start to this birthday dinner. What a treat it is to taste and drink Selosse’s 1998 Brut Blanc de Blancs. Anselme Selosse’s wines are nearly impossible to find, but his wines from the 1990s and 1980s are truly rare birds. The 1988 Blanc de Blancs is rich, vinous and deep, with more power and volume than most Champagnes in this vintage. Creamy and ample, with plenty of apricot, smoke and honey overtones, the 1988 satisfies all the senses. Well-stored bottles will drink well for another decade or more. A bottle of Krug’s NV Grande Cuvée, most likely from the 1960s, is utterly spellbinding, with phenomenal purity in its flavors and remarkable finesse in its mousse. Unfortunately, I can’t tell you anything more about this stellar Champagne because for decades Krug bottled their flagship wine as a NV Champagne with absolutely no information that might have differentiated one release from another. Aside from the very obvious – that this practice was hugely anti-consumer – it also almost certainly resulted in quite a bit of economic upside being left on the table because certain exceptional editions, such as the current 164ème Édition, were not given the space to stand out. Champagne is not Coca-Cola. Or, at least, it shouldn’t be treated as such. Decanting and aeration are understood to be highly beneficial in allowing red wines to show at their best, but whites are seldom given the same type of attention. That is a mistake, because fine white wines (and Champagne, too) are often at their best several hours after opening. 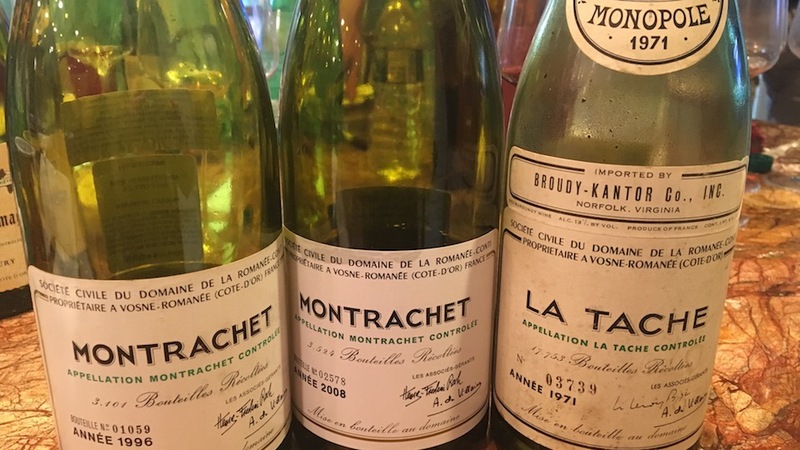 That is certainly the case with the 1996 Montrachet from Domaine de la Romanée-Conti, which needs quite a bit of time to open up. When if finally does, the wine is magnificent. In the last year or so, the 1996 has started to turn the corner as some of its youthful freshness fades into a set of more mature flavors and textures. Even so, 1996 remains one of my very favorite vintages of this wine. The 2008 Montrachet, which is usually a total hedonistic turn-on, shows an extra bit of polish to balance some of its more overt leanings. Tangerine oil and exotic floral notes abound in a deeply satisfying Montrachet that should drink well for another 20 years. This is my last bottle of Bruno Giacosa’s 1978 Barolo Riserva Villero di Castiglione Falletto. What a wine. Intensely aromatic and deep, the 1978 presents a veritable kaleidoscope of Nebbiolo flavors and textures. At nearly forty years of age, the 1978 remains a testament to the profound wines Bruno Giacosa made in this historic vintage. With air and the passing of several hours, the 1978 gains in stature. Still monumental and intense, ’78 Villero is utterly profound. Readers who own it should be thrilled. In this tasting of more Old World-leaning wines, Luciano Sandrone’s 1990 Barolo Le Vigne is almost shocking in its fruit intensity. The Le Vigne, here in its debut vintage, is a blend of fruit from several sources. On this night, it is pure, racy and bold from start to finish, in classic Luciano Sandrone style. Coche-Dury’s 2012 Corton-Charlemagne is surprisingly ethereal. The flavors are naturally very bright and citrus-driven at this early stage in the wine’s life. A hint of Coche reduction runs through the 2012, but is not at all intrusive. Lemon peel, white flowers, mint and crushed rocks are nicely delineated. As good as the 2012 is now, it will be even better once it fills out a bit more. Sadly, this is not a good bottle of the 1996 Corton-Charlemagne. When it is on, the 1996 Charlemagne is one of the greatest wines on Planet Earth. At twenty-one years of age, it is hard to say the 1996 is prematurely oxidized, but what is evident is that this bottle is far from being truly representative. Rousseau’s 1989 Chambertin is delicate, sensual and beautifully perfumed. Silky and gracious, the ’89 is absolutely exquisite tonight. I would prefer to finish any remaining bottles over the next handful of years, as the fruit appears to be drying out. Hints of dried flowers and sweet tobacco reinforce the impression that the wine is approaching its full maturity. This is a very fine bottle of the 1971 La Tâche. Beautifully persistent and nuanced, the 1971 possesses exceptional finesse throughout. Not surprisingly, the 1971 has shown better of late from large format. From bottle – this bottle at least – the 1971 is just a touch slender. That in no way detracts from its striking perfume and lovely overall balance. 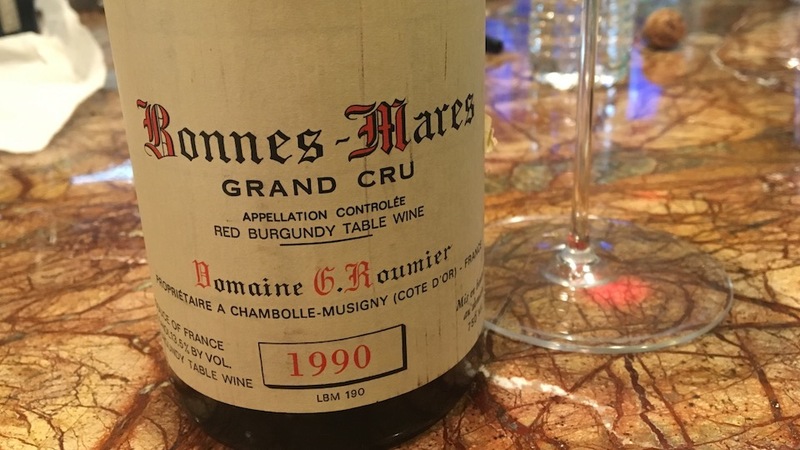 Roumier’s 1990 Bonnes-Mares has been nothing short of exceptional every time I have tasted it. Remarkably deep, pure and rich in texture, the 1990 has more than enough going on to satisfy all of the senses. The warm vintage and time in bottle have softened some of the typically hard Bonnes-Mares tannins. What comes through today is a wine of total sensuality. I suspect the 1990 will drink well for another 20+ years. Once again, the 1990 Bonnes-Mares is compelling. 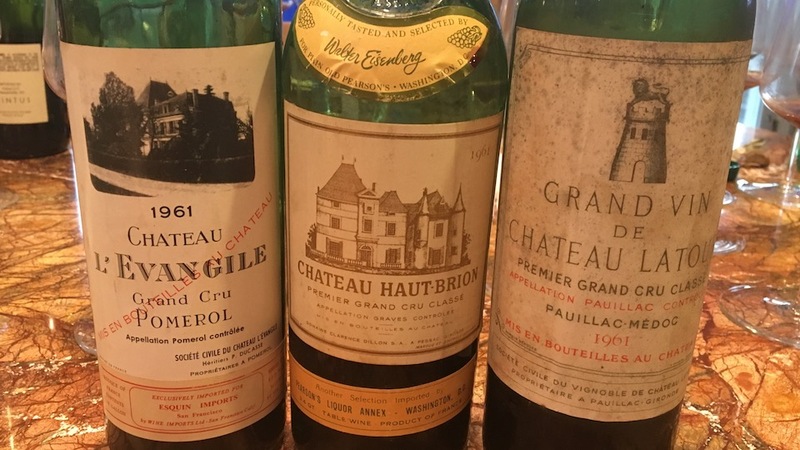 A trio of 1961 Bordeaux rounds out the evening. The 1961 L’Evangile is off the charts. A wine of stunning depth, intensity and structure, the 1961 hits the palate with copious dark cherry, plum, chocolate, smoke and licorice, all with a huge backbone of tannin that ensures it will continue to drink well for several decades, or as long as corks hold out. The wine itself is essentially immortal. I have had the good fortune to drink the 1961 several times recently, and while this is not the very best bottle I have had, it is still a head-turner. Wow. Even better, the 1961 Latour is as profound as wine can be. It’s as simple as that. Dense, seamless and remarkably deep – especially for a wine of its age – Latour is another timeless classic from this epic Bordeaux vintage. All the elements magically fall into place in a spellbinding Pauillac endowed with magnificent depth and pedigree. Powerful and towering, with a real feeling of vertical structure, the 1961 Haut-Brion fleshes out in every dimension with superb persistence, seemingly endless fruit and beguiling aromatic intensity. There is an explosive energy to the 1961 that is spellbinding. This is another captivating, alluring wine that is very hard to move past. I just want to bask in its glow all afternoon. As profound as these wines are, the opportunity to follow them over several hours with a small group of close friends makes for memories that will last forever.